where K is a constant which depends on the shape and size of the poles. Eddy current dampers have the advantage of a variable damping constant, because the strength of the electromagnet can be changed by ground command. The SAS dampers could also be tuned in flight for different spin rates by changing the spring stiffness of the damper and hence its frequency of vibration. Ball-ln-Tube Damper. A ball-in tube damper, shown in Fig. 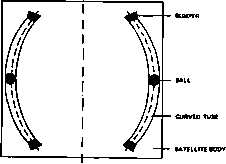 18-21, consists of a closed, curved tube in which a ball is allowed to roll freely. The damping caused by rolling friction may be augmented by viscous damping if the tube is filled with a viscous fluid. The ends of the tube may have energy-absorbing bumpers. The damper behaves like a centrifugal pendulum and its frequency of vibration is directly proportional to the spin rate of the body on which it is mounted. Hence, if such a damper is tuned initially, it remains tuned for different spin rates. These dampers are mounted on the spinning portion of a dual-spin spacecraft and on single-body spinning spacecraft. They have been used by most of the early ESRO spacecraft, including ESRO-II and -IV and HEOS-1 and -2. Viscous Ring Damper. Viscous ring dampers dissipate energy by fluid motion inside a ring. Although the study of these dampers began in 1960 [Carrier and Miles, 1960], interest in this type of damper has increased because of energy dissipation in heat pip«. A heal pipe is typically a fluid-filled aluminum pipe used to maintain near-isothermal conditions during the nonspinning phase of a spacecraft mission. During the spinning phase, the heat pipes act like viscous ring dampers. ATS-S, launched in August 1969, was spinning about its minor axis and was supposed to spin about its major axis after the apogee boost motor had fired and the casing had been ejected. However, the unexpectedly high energy dissipation in the heat pipe caused the spacecraft to enter a flat spin before the casing was ejected. After ejection of the casing, the spacecraft started spinning about the desired major axis, although the spin direction was opposite that desired. Viscous ring dampers may be mounted either in, or perpendicular to, the spin plane. We discuss first the performance of a damper mounted in the spin plane and later discuss a simplified model of a damper mounted in a plane perpendicular to the spin plane. The damper flown on the ARYABHATA satellite consists of a fiberglass tube partially filled with mercury. The damping produced by viscous ring dampers depends on whether the flow through the tube is laminar or turbulent. For small nutation angles (< 1 deg), the fluid in a damper mounted in the spin plane is spread around the outer portion of the tube and has a free surface at the center of the tube. In such a mode, the damper performance depends on the frequency of the surface waves. For larger nutation angles, the fluid acts as a lumped mass or slug. The motion of the slug depends on the viscous drag and centripetal acceleration. If the nutation angle is small (1 deg to 10 deg), the viscous drag is large compared with the centripetal acceleration and the slug is dragged around the body with a small oscillatory motion. This is called the spin-synchronous mode and a small oscillation is superimposed on the nutation angle decay [Alfriend, 1974], For larger nutation angles, the force due to centripetal acceleration exceeds the viscous drag force and the slug rotates with respect to the body at the body nutation rate. In this nutation-synchronous mode the slug is slightly offset from the Z/L plane because of the viscous drag. The transition angle between the spin-synchronous and the nutation-synchronous modes depends on the damper parameters and it is possible that the "spin-synchronous" mode may not exist if the ring is not eccentric to the spin axis. Active nutation damping involves the use of a sensor to measure the nutation phase and possibly its amplitude as described in Section 16.3, and an actuator to change the angular momentum of the system. Sensors commonly used are Sun sensors, horizon sensors, magnetometers, and rate gyros. The actuator may be a magnetic coil, a gas jet, a momentum/reaction wheel, or a control moment gyroscope. Active damping may be done by an open-loop system, in which case the actuator is activated by ground command, or by a closed-loop system, which requires some onboard logic circuitry between the sensors and the actuators. Magnetic Notation Damping. 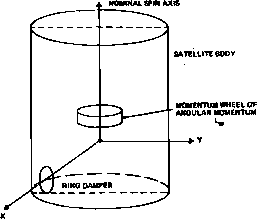 An open-loop magnetic damping method has been developed and used at Goddard Space Flight CenteT [Fladey, 1972] to handle circumstances in which a spacecraft may be nutating unexpectedly. This was used when SSS-1 developed unexpected nutation due to thermo-elastic flutter and when the pendulum damper of SAS-3 became stuck at its maximum amplitude. We assume that the active nutation damping procedure is performed over a sufficiently short time so that we can neglect the change in the orientation of the geomagnetic field vector with the spacecraft's motion. When a constant current is passed through the spin axis coil, the direction of the resulting torque in inertial space is nearly constant, although it will change slightly depending on the size of the nutation cone. The transverse component LT of the angular momentum vector rotates in space at the inertial nutation rate and in the body at the body nutation rate. 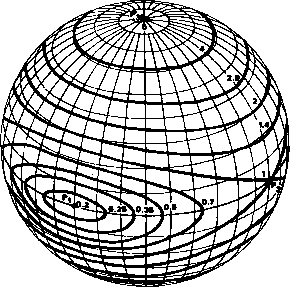 If the spin axis is the major axis, the spin plane component of the geomagnetic field rotates in the opposite direction at the spin rate of the body and its direction can be measured by a magnetometer. The nutation phase is determined from Sun sensor data, as described in Section 16.3. A time and polarity for the current is selected so that the magnetic torque is opposite in direction L-, for half the inertial nutation period, after which the polarity of the current is reversed. The resulting torque will oppose LT over the second half of the inertial nutation period. Thus, this nutation damping technique consists of (I) the proper selection of a time and polarity for the magnetic coil current and (2) reversal of it every half inertial nutation period. Thus, LT and consequently the nutation can be reduced to zero. Gas Jets. An open-loop gas jet nutation damping scheme was planned but not needed for the CTS spacecraft. As described in Section 1.1, CTS has 16 low-thrust engines which are mounted around a wheel at different distances from the spin axis. The nutation phase and amplitude can be determined on the ground from Sun sensor and rate gyro data (see Section 16.3). Nutation is damped by adding angular momentum equal and opposite to the transverse angular momentum and the timing is such that the spin axis is closest to the desired direction. (Section 16.3 presents an analysis of timing requirements for gas jet nutation damping.) The first of these conditions can be fulfilled by an appropriately timed single thrust. However, the second condition can be fulfilled only by changing the direction of the thrust vector in the body coordinate system. This can be done by choosing an appropriate combination of available jets. A precession maneuver from one attitude to another which includes nutation damping can ideally be accomplished by firing the jets twice, as shown in Fig. 18-23. The first impulse is such that the new angular momentum vector points halfway between the two attitudes and the second impulse of the same polarity and magnitude is fired after half a nutation period.